The Grill Plate Mystery - SOLVED! 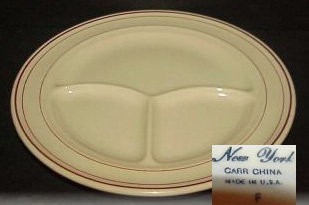 Collectors of Carr China have likely run across the occasional grill plate. 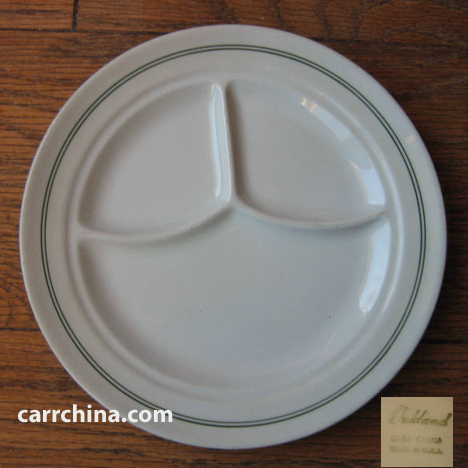 These divided plates were popular in the 1930s, 1940s and 1950s and often found in the cafeteria-style restaurants that flourished in urban areas. Oakland - a three-compartment plate measuring 9 1/4"
Detroit - a five-compartment plate measuring 9 1/2"
St. Louis - a three-compartment plate measuring 9 1/2"
New York - a three-compartment plate measuring 10"
Chicago - a three-compartment plate measuring 10 1/4"
Philadelphia - a three-compartment plate measuring 11"
The patterns which appear on the plates are not always identified separately, which I believe has likely contributed to the confusion that has existed. Now we know! Thanks, Bill! 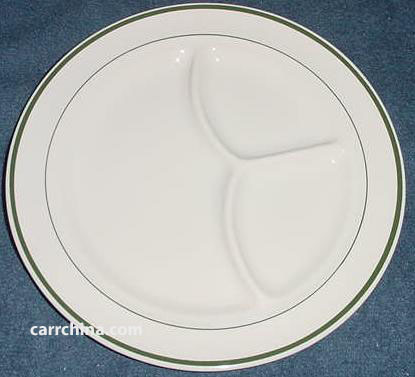 This grille plate is marked "Oakland / Carr China / Made in U.S.A." and contains the two-line gree ink borden design on white ware. 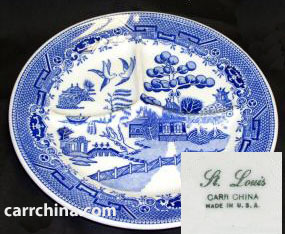 This grille plate contains the backstamp "St. Louis / Carr China / Made in U.S.A. It is decorated with the willow pattern in blue ink. Other examples of the Willow design on the grille blank have been found with red ink. This is the Chicago version of the Carr China grille plate. It is a standard white grille blank with the distinctive two-line design of one thick and one thin green line that denotes the popular Carr Chicago design. Unfortunately, I do not have the backstamp image. This grille plate is on a Glo-Tan body and is decorated in a three-line red border. It is backstamped "New York / Carr China / Made in U.S.A. / F."